Ziplining is safe, and yet exhilarating at the same time. You always get a huge adrenaline rush when rushing along a steel wire 100 feet above the ground at 40 mph. Exploring new and exotic locations is also really enjoyable, especially if the environment you are visiting is rich in beautiful geography, tropical plants, and unusual animals. If you take a ziplining tour (also known as a canopy tour because of the view over the “canopy” of the forest) in Costa Rica, you can combine both of these fun activities. 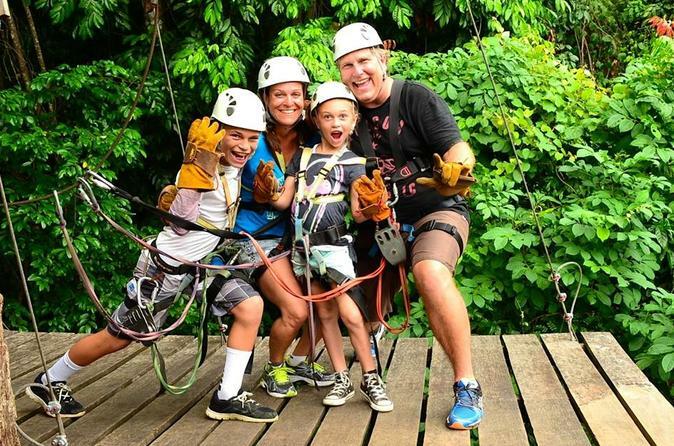 And zipline tours are fun for all ages. This is an especially large zipline park, the longest linear feet in Costa Rica, with 25 cables that traverse over 11 different waterfalls. The spectacular views of ocean, rainforest and mountains are second to none. 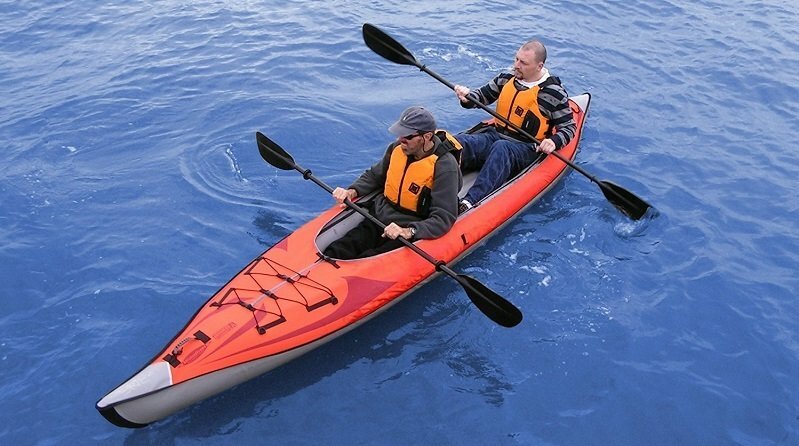 Very professional guides and equipment make this a safe and worry-free excursion. You can also swim in a mountain pool and have a cool beverage in the El Tucan restaturant. Zipline is an excellent way to see the rain forest from vantage points that are otherwise unavailable. Even more panoramic and scenic is the view from a hammock bridge stretching across a long expanse of the jungle. This set of ziplines and the 15 meter vertical rappel line that follows are considered medium difficulty, so anybody can participate without being uncomfortable. The guides and equipment are top notch, as Monteverde has long been an adventure traveler destination. After your hotel pickup in the morning you will be taken to Puerto Viejo de Sarapiqui for a full day of adventure of a river boat ride and zip lining through the rainforest canopy. On the 2 hour boat ride you will see colorful toucans, howler monkeys, sloths and crocodiles. After the boat ride you have your choice of a horseback ride or a zip line tour of the canopy. Here you will get a birds eye perspective of the rainforest as you soar from platform to platform. 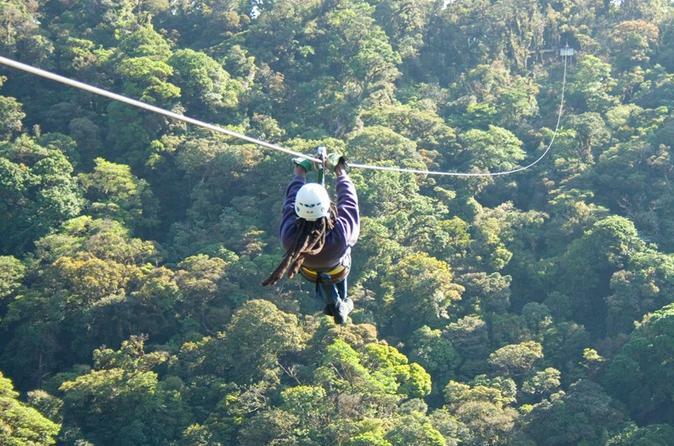 On this half day tour from San Jose, see the best of Costa Rica on the jungle canopy zipline adventure. You will take a short hike into the rainforest to the first platform where you will suit up. Then you will soar through the jungle canopy from platform to platform enjoying views of waterfalls, exotic birds and lush vegetation. After your zip line adventure, enjoy lunch before heading back to your hotel. Here you will combine two things two things Costa Rica is famous for: zip lining and white water rafting. Start out with a zip line adventure where you will soar through the air for almost 2 miles at almost 40 MPH! Then move on to white water rafting on the Balsa River. Experience some challenging rapids combined with a scenic tour of the jungle. This tour combines adventure along with seeing jungle wildlife like monkeys, sloths and many tropical birds including toucans. 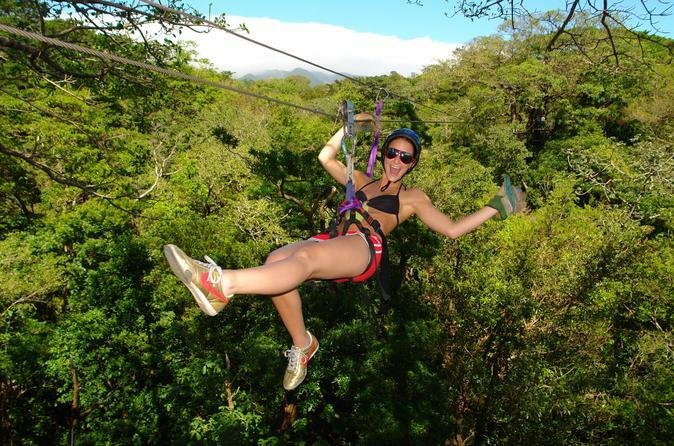 Why Should You Go on a Zipline or Canopy Tour in Costa Rica? With increases in global tourism, zipline canopy tours are now available on five continents, but the revolutionary idea to see interesting locations through this particularly unusual and unique viewpoint all began in the 1970s in Costa Rica. 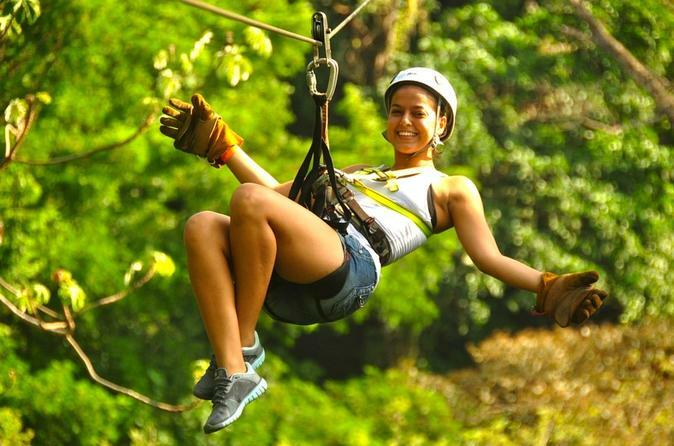 Because canopy tours were pioneered there, today Costa Rica offers a huge variety of sites in different kinds of location that can offer you a monkey’s eye view of the world. This is a country where you can stand on thick branches 100 feet above the ground and gaze down at the surrounding lush tropical jungle. Alternatively, you can zipline around one of the world’s most active volcanoes, or take a tour where you zipline in front of 11 beautiful waterfalls. The name Costa Rica can be translated as “rich coast”, and this small nation truly is rich in magnificent vistas. Where else could you gaze out over both the Pacific Ocean and the Caribbean Sea on the same holiday? And why not do that from high up in the canopy? But it’s the lush flora and exotic fauna that draws many tourists. Costa Rica contains 5% of the world’s biodiversity. 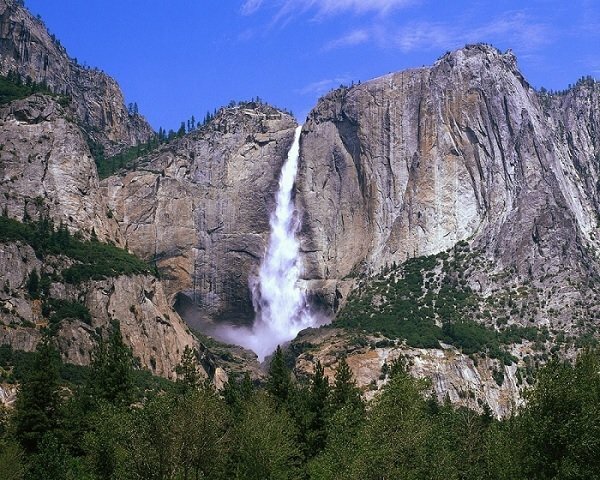 A whole quarter of the country is designated as a protected forest or forms a nature reserve. Fifty-two unique and beautiful species of hummingbird hover around the flowers, and 500 kinds of orchid and many endangered bird species may be found around the Monteverde cloud forest. Canopy tours are the best method to experience this magnificent world, because in rain forests 50% of plant species grow in the highest branches of trees, and the habitats of 90% of the animals in Costa Rica are found within the forests’ canopies. Zipline tours are so well established in this country that you will find experienced and knowledgeable bilingual guides at all the fascinating locations where canopy tours have been organized. Of course, not everybody wants the exhilarating adrenaline rush of a speedy zipline. That’s why there are also aerial trams to take people on tours where they just have to stand still and also hiking tours that include hanging bridges high up in the canopy in many beautiful locations. 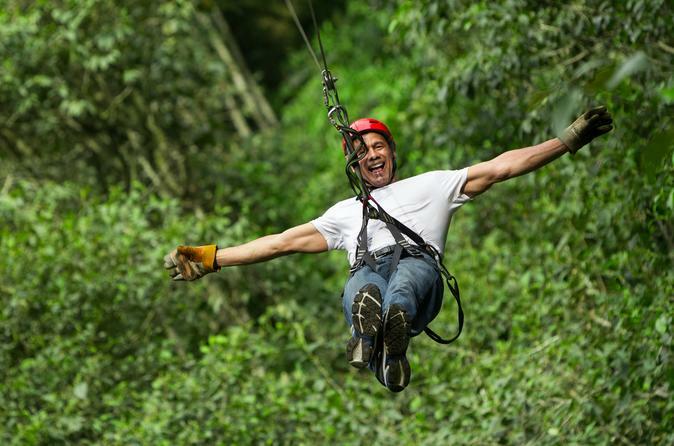 Almost anybody, whatever their physical condition or age, can enjoy a canopy tour. And canopy tours are not the only reason you might want to visit Costa Rica. This tiny nation has developed a well-deserved reputation for being the happiest country in the world. The lifestyle is so great there that the life expectancy of 79 years is the highest in Central America. And the population are so peace loving that not only is the United Nations University for Peace based there, but they don’t even have a standing army. While you are there, you might like to try your hand at some of the other wonderful activities many tourists enjoy, such as mountain climbing, swimming, surfing, hiking, and horse riding. 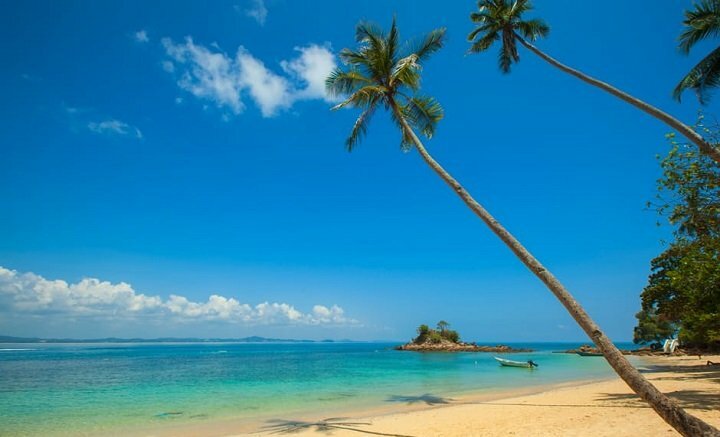 With its tropical climate, Costa Rica offers great weather for surfing or swimming. The sea is around 78 degrees fahrenheit time of year! And there are locations with suitable waves for surfing all year long. The many forests, mountains, and volcanoes make great places to hike, and many canopy tours combine hiking with ziplining. The two long coastlines provide excellent beaches for riding a horse along and enjoying beautiful sunsets. There are literally hundreds of places you can go ziplining in Costa Rica, and many of them feature magical landscapes with unique flora and fauna. To whet your appetite for adventure, here are a few details about four great places you can consider visiting while you are there. The Arenal Reserve in the northern province of Alajuela is fascinating not only because of the pristine rain forest but also the fact that this is the location of the Arenal Volcano, one of the world’s most active in recent years. If you ever had to draw a diagram of a volcano in school, a perfect cone with a hole on top, then that’s exactly what this marvel of the natural world looks like. A zipline tour at the Arenal Reserve begins with an aerial tram ride through the forest canopy to a starting platform elevated high above the ground. Aerial trams transport you safely and in comfort inside a covered cab. From that first platform, you use ziplines to glide you through the canopy from platform to platform, enjoying the scenery from a monkey’s viewpoint as you descend through the trees. This tour allows you a unique view of the Arenal Volcano from the very top of the surrounding forest’s canopy. If you feel like a slower paced view of the Arenal Reserve, then there are 15 suspension bridges built within the canopy. Some reach as high as 200 feet above the ground. You may walk from treetop to treetop to obtain a bird’s eye view of the forest. This allows you to take in the many wonderful views at the speed you choose, and you can linger at your favorite places if you so wish. This enthralling walk ends at the Arenal hot springs, where waters heated by the magma laying not far beneath your feet can be used to relax your sore muscles after your long hike. 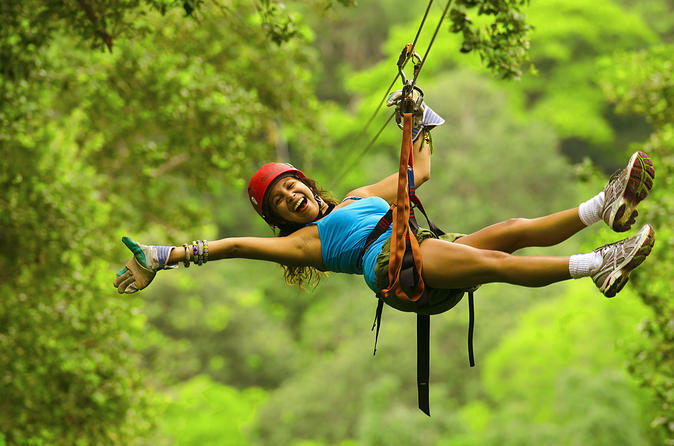 In the northwestern province of Guanacaste, on the Pacific Coast, you’ll find the Diamante Superman Canopy Zipline. If you’ve ever watched the movie Divergent, you’ll understand what I mean. The ziplines on this tour are similar to the one Tris uses to fly through that half-ruined building as she flies down from the Sears Tower (Willis Tower) in a post-apocalyptic Chicago. Yes, you fly everywhere head first, just like Super Girl, hence the name of the tour. 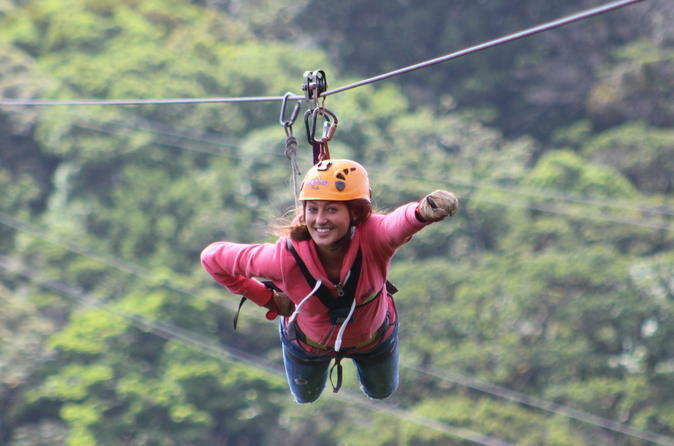 The ziplines here fly you across the tropical forest, and allow you views of both the Pacific Ocean and the mountains. In the Central Highlands of Costa Rica you can find the famous cloud forests. These are lush forests in high elevations that seem to float in the clouds. Seeing these, you might be reminded of the Hallelujah Mountains in James Cameron’s movie Avatar. Because they are cooler than the tropical rain forests found at lower elevations, these forests offer a rich palette of biodiversity that differs significantly from that seen in other areas of Costa Rica. In San Luis there are a series of 12 ziplines that can whisk you across a beautiful river landscape within the cloud forest. Nearby, the Monteverde Cloud Forest Reserve is deservedly famed for its lush flora. National Geographic Magazine once called this reserve “the jewel in the crown of cloud forests”. A visit to any of the cloud forests is an opportunity to cool down from the tropical heat of lower laying rain forests. If you are accompanied by a bilingual guide who is knowledgeable about the unique flora and fauna of this location, you will take home many memories that will last a lifetime. Further south, near the town of Tajo Alto you can find the Vista Golfo Adventure Park where what is claimed to be the longest zipline tour in Costa Rica can glide you along 25 ziplines through the rain forest canopy and across the front of no less than 11 gorgeous waterfalls. On this tour, you also have the invigorating option to go swimming in a mountain spring fed pool. 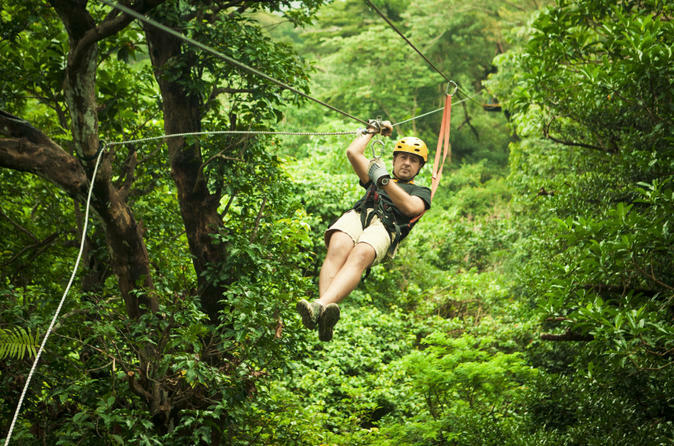 There are many, many more wonderful places where you can zipline in Costa Rica. Click on this button for details on all of the zipline tours in Costa Rica. The peak tourist season in Costa Rica is from December to April. That’s when the country experiences its “dry” season. From May to November, Costa Rica sees heavy rainfall. Often, hotel prices and airfares are cheaper during this “green” season. The plants and animals are there whether it’s raining or not, so the rain might not be a problem for you. However, be aware that some tourist sites may be closed during the green season, and visibility may be poor in the rain. In spite of this, you will find that many, if not all, ziplining adventures still operate right through the green season. The green season is when many plants exhibit interesting periods of their growth cycle, so you might find them more interesting at that time. Also, those 11 waterfalls near Alto Rico will most certainly be much more dramatic and impressive when it’s been raining a lot. Check with our tour operator to ensure that all the sites you want to visit are open at the time you wish to visit. If you have particular events you’d like to experience, like the turtle eggs hatching on the Pacific Coast beaches, ask the experts when the best time is for you to go there and exactly where you can find what you most want to see. Ziplining has a long history. Historically, Ziplines have found practical use as a means of crossing natural barriers, such as gullies or rivers, in places where building a bridge was not economically viable. Also, they have been used by people who must work in high locations, such as steeplejacks or roofers, for rapid descent to ground level. However, in recent decades ziplines have become increasingly more popular as both items of playground equipment and as part of adventure obstacle courses. In the 1970s, someone in Costa Rica realized that using a zipline would be a great way of exploring the otherwise inaccessible rain forest canopy. This idea led to the creation of many fascinating canopy tours around the country. In its simplest form, a zipline comprises of a stainless steel cable mounted between two solid and sturdy objects on a slope, and a pulley suspended from that cable. A person holding or attached to that pulley may then slide from the higher object to the lower powered only by gravity. More complex ziplines use a “trolley”, which is a frame holding two or more pulleys. This allows the weight of the passenger to be spread over more than one point on the cable, reducing cable wear and increasing the security of the harness and overall safety. Ziplines on canopy tours are often operated at higher speeds than the small ziplines close to the ground in playgrounds. They also tend to be much higher above the ground and run over a longer distance. For these reasons, users will probably be required to wear a safety helmet while on the tour. Passengers are firmly attached to the trolley by a harness, which sometimes will hold them like a baby carried by a stork, but sometimes will allow them to fly through the air like Super Girl, suspended horizontally with their chest pointed downward. Around Costa Rica, you will find several very long and very high ziplines, maybe as long as 1,000 feet and as high as 30 feet. With longer cables, some sag will be obvious. This is not something to be concerned about. The tension of cables may be adjusted to obtain an optimum quality of ride. Given that you’ll be hurtling along a cable at up to 50 mph and whizzing past thick tree trunks, you may harbor some concern about how you will stop. Don’t worry. All ziplines have some means of stopping built-in. The breaking system you’ll most likely come across is powered by gravity. A gravity stop makes use of that sag mentioned earlier. Once the trolley passes the bottom of the sag, its belly, then you will be gliding up rather than down. At that point, gravity will work to slow you down. The termination point, where you must get off, will be placed somewhere where the natural deceleration caused by gravity means you arrive at a comfortable speed to stop. 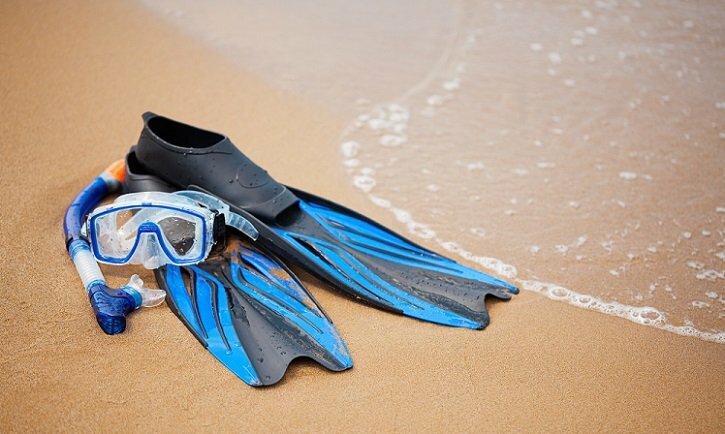 Be careful to read through all the literature provided by your tour company, especially for any health requirements and things you are recommended to take along with you for the particular sites you are going to visit, as well as for any visit to Costa Rica. • Some ziplines have a maximum weight limit, for example 280 lbs on the ziplines at Tajo Alto. • For more demanding tours, you are also expected to be in relatively good physical condition, with at least average mobility in your arms and legs. Some tours may even include such activities as abseiling or mountain climbing along the route, so please do make sure you know what you are signing up for and make sure that it is exactly what you want. • Sometimes there are also rules on what clothing you may wear on ziplines for safety reasons, so flip flops and other kinds of sandal, for example, will not be allowed. • When you turn up at some tours you’ll find that they require a minimum number of people to operate the tour because they will have to send a guide along. • Research each location a little before going, and you’ll get a lot more out of your visit! One final but important note. Given that Costa Rica is a tropical country, there are a lot of insects, and up above the canopy, you will have little shade. Please do remember to take along a bug spray and some suitable sun protection, especially if you have fair skin or are allergic to insect stings. Costa Rica is one of the best places in the world to observe the magic of Mother Nature up close, and you can’t get closer than flying through the canopy on a zipline. If you love the thrill of ziplining, and you enjoy seeing exotic plants and animals in their natural habitat, then you won’t find a better country than Costa Rica to indulge in your passions. For that reason, I strongly advise you book a canopy tour holiday in Costa Rica right now.